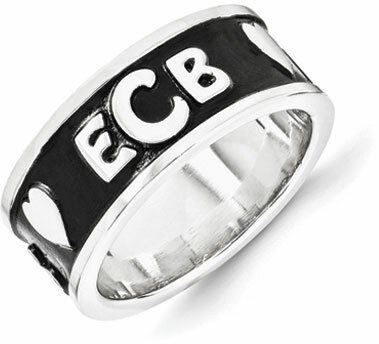 This black and silver ring holds a beautiful enamel finish and a monogram design that make the piece truly unique. The Enameled Monogram Ring in Sterling Silver is a charming piece that is decorated with contemporary lettering and accent hearts along the side, making it fun to wear and show off. This lovely ring is cast in sterling silver and features a 9mm-wide band, which has silver on the inside and enamel on the outside. The black enamel adds a glassy surface to the ring while the silver monogram and hearts peek through to polished perfection. The monogram is made up of three letters of your choosing, with the middle letter being slightly bigger than the rest. The ring also features a beautifully polished, silver edge that creates an ideal border against the black enamel finish. This ring is inspired by light and dark, which is represented through the black enamel and sterling silver to dramatic effect. Overall, the monogram letters have a brilliant position on the ring, letting them stand out for all to see. The silver hearts also feature prominently on the ring to add a touch of fun to the design. Ring measures 9mm (3/8") in width. We guarantee our Enameled Monogram Ring, Sterling Silver to be high quality, authentic jewelry, as described above.